The patient, a 23 year old student, initially presented to another hospital with swelling of his left eye. Clinical examination showed only isolated proptosis of his left eye. A computed tomographic (CT) scan of his orbits was consistent with orbital pseudotumour, for which he was given a short course of oral steroids, with good clinical response. He was then lost to follow up as he returned home from his studies. A few months later he presented to the physicians in our hospital with a 2 week history of painful swelling of his left eye, accompanied by polyarthralgia, fever with rigors, and lethargy. Further questioning showed he had mild photosensitivity and frequent mouth ulcers of several months’ duration. He had not been receiving any other drug before the onset of symptoms. At the time of admission he was clearly unwell and extremely lethargic, with a temperature of 37.4°C. He had no facial rash, but he did have tender proptosis of his left eye. There was no associated ophthalmoplegia. He had bilateral knee effusions and swelling of the small joints of his hands. A full blood count showed a total white cell count of 1.7×109/l (normal 4–11×109/l) with neutrophils of 1.1×109/l. Haemoglobin was 140 g/l (130–180 g/l) and platelet count was 82×109/l (150–400×109/l). Erythrocyte sedimentation rate was 25 mm/1st h (normal <10 mm/1st h) and C reactive protein was 5.4 mg/l (<10 mg/l). Urine analysis disclosed +1 of both protein and blood. Blood urea was raised at 11.6 mmol/l (<7 mmol/l) and creatinine was 169 μmol/l (<125 μmol/l), while liver function tests were within normal limits. A provisional diagnosis of neutropenic septicaemia was made, and treatment was started with intravenous gentamycin and piperacillin. All bacterial cultures taken before starting antibiotics were, however, negative and he remained pyrexial during this treatment with no symptomatic improvement. A chest x ray examination, ECG, and transthoracic echocardiogram were all normal. 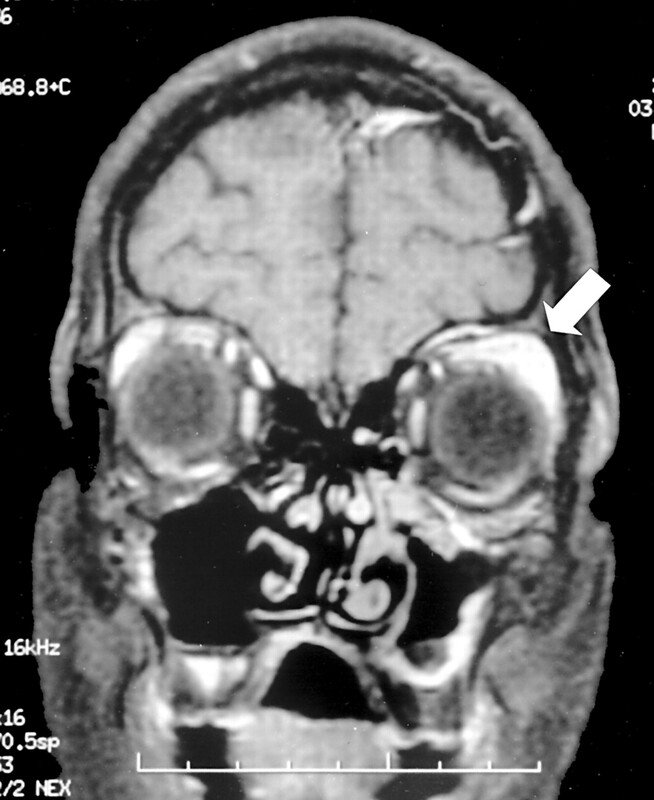 A magnetic resonance imaging (MRI) scan of his orbits showed a lesion superolaterally on the left, in keeping with an orbital pseudotumour (fig 1). Serology tests revealed strongly positive antinuclear factor (ANF) (titre of 1/1280) and double stranded DNA (560 IU). In light of the above results, and his failure to respond to broad spectrum antibiotics, a diagnosis of systemic lupus erythematosus (SLE) was made. A subsequent renal biopsy showed mesangial expansion without frank proliferative glomerulonephritis, in keeping with type I renal disease. Administration of intravenous methylprednisolone (1 g) resulted in dramatic improvement within 24 hours. The fever and swelling of his eye rapidly resolved, while his white cell and platelet counts increased to normal limits. He remains well with low dose oral prednisolone and azathioprine. T1 fat saturated MRI scans of the orbits with contrast. There is an intermediate signal mass lesion superolaterally on the left (arrow), which enhances with contrast. Patients with SLE can present with a variety of ocular manifestations, with keratoconjunctivitis sicca being the most common ocular finding.1 Retinal involvement, usually due to vascular damage, is reported to occur in 10% of patients with SLE and is an important manifestation as it may reflect systemic disease activity.2 In addition to our case, several other reports of SLE presenting with proptosis due to orbital pseudotumour have been published.3–12 Orbital pseudotumour, part of the spectrum of idiopathic orbital inflammation, is a non-granulomatous inflammatory disorder that may affect any structure in the orbit. It is defined according to the orbital structures affected, with the presenting symptoms reflecting the degree of inflammation and the location of the inflamed tissue.13 Patients with an acute presentation may complain of generalised malaise, in addition to ocular symptoms, but are generally afebrile,13 unlike our patient. Infections such as orbital cellulitis can mimic the features of orbital pseudotumour and should be excluded in patients with pyrexia before any immunosuppressive treatment is started. The acute presentation of orbital inflammation is usually with an abruptly painful eye, commonly associated with impaired vision. Mass effect in the orbit tends to be more pronounced in chronic cases, while myositis is suggested by painful diplopia exacerbated by eye movements. The diagnosis can usually be made on clinical and radiological (MRI or CT) grounds, avoiding the need for biopsy in most cases. In conclusion, we present a patient whose initial presentation of SLE was isolated proptosis due to orbital pseudotumour. Although this is an uncommon presentation of SLE, the patient’s diagnosis was delayed until he presented with severe systemic features, including renal disease, which might have been avoided by performing an autoantibody screen at the initial presentation. SLE should be considered in the differential diagnosis of orbital pseudotumour, and features suggestive of SLE should be actively sought on clinical history and examination. As determination of ANF is a readily available and relatively inexpensive investigation, we propose that this should be considered in the investigation of orbital pseudotumour, particularly when systemic symptoms are present. Infections, particularly orbital cellulitis, must be excluded in pyrexial patients before starting immunosuppressive treatment. Nguyen QD, Foster CS. Systemic lupus erythematosus and the eye. Int Ophthalmol Clin1998;38:33–60. Ushiyama O , Ushiyama K, Koarada S, Tada Y, Suzuki N, Ohta A, et al. Retinal disease in patients with systemic lupus erythematosus. Ann Rheum Dis2000;59:705–8. Brenner EH, Shock JP. Proptosis secondary to systemic lupus erythematosus. Arch Ophthalmol1974;91:81–2. Wilkinson LS, Panush RS. Exophthalmos associated with systemic lupus erythematosus. Arthritis Rheum1975;18:188–9. Evans OB, Lexow SS. Painful ophthalmoplegia in systemic lupus erythematosus. Ann Neurol1978;4:584–5. Weinstein GS, Dresner SC, Slamovits TL, Kennerdell JS. Acute and subacute orbital myositis. Am J Ophthalmol1983;96:209–17. Grimson BS, Simons KB. Orbital inflammation, myositis, and systemic lupus erythematosus. Arch Ophthalmol1983;101:736–8. Bankhurst AD, Carlow TJ, Reidy RW. Exophthalmos in systemic lupus erythematosus. Ann Ophthalmol1984;16:669–71. Feinfield RE, Hesse RJ, Rosenberg SA. Orbital inflammatory disease associated with systemic lupus erythematosus. South Med J1991;84:98–9. McDonald E , Marino C, Cimponeriu D. Painful ophthalmoplegia in a patient with SLE. Hosp Pract1992;27:41–2. Serop S , Vianna RNG, Claeys M, DeLaey JJ. Orbital myositis secondary to systemic lupus erythematosus. Acta Ophthalmol1994;72:520–3. Keane JR. Eye movement abnormalities in systemic lupus erythematosus. Arch Neurol1995;52:1145–9. Weber AL, Romo LV, Sabates NR. Pseudotumour of the orbit. Clinical, pathologic and radiologic evaluation. Radiol Clin North Am1999;37:151–68.